If you’ve never played a Tropico game, you may not realize the difference between this series and any other simulation game. You might not realize all the political parody that defines Tropico. If you follow along with campaign narration and read the additional commentary tucked into the corners of the game, you will no doubt laugh at the subtle — and not so subtle — jabs at things like communism, capitalism, certain famous figures in history, and cultures that might be found in such a fictional place as Tropico. In Tropico 5, it only gets better as you, El Presidente, bring your island up from Colonial times, wedged between other superpowers, through all the familiar eras of our planet’s history. The fun of this game comes from experimenting with the exact ways you can choose to run your little country. Seeing what you can get away with, or seeing just how happy and loyal you can make your citizens, is the real appeal of this game. Yes, you have to research new technology, make money with farming or mining etc., and construct housing for your citizens, but every one of those choices has its own weight on political aspects. You can construct churches to increase quality of housing in the area, but if you are an atheist country by your constitution, this may lower your approval rating. If your approval rating gets too low, you may not win the next election (if you have those), or a rebellion may threaten to overthrow your rule. One thing you can do to help your situation is create a dynasty. Each ruler, the first being customized by you at the beginning of the game, has a special trait. My first ruler, Tete Ivles McKittensby, was a Cheapskate, and so lowered all constructions costs while she was in power by 4%. Eventually, the game prompts you to find a new heir (by ridiculous means like a singing competition or thumb-wrestling match), and that new person will be selectable as a candidate for any election. Also, if you upset one of them too much by not siding with them on other trivial matters, they can rebel and try to overthrow you. You can also send them off to do special tasks like spy on an enemy faction or get a fancy degree to add merit to your regime. This is a really unique gameplay mechanic that I have not seen before, and your dynasty even carries over to multiplayer and sandbox modes. The game feels more robust with such a lasting element that can possibly produce much varying gameplay. Another sneaky, new mechanic is your personal Swiss bank account. This is represented by two dollar signs in front of any amount that concerns your personal account. This is where you can really become a corrupt leader and laugh all the while. The purpose of this account is to get you out of tight spots in the campaign, or to level up your dynasty members (ex: that 4% I talked about becomes 6%). If you are lucky enough to discover a manager that siphons off a percentage of a building’s revenue to put into your account, saving up becomes easy. Here is a minor spoiler, but one that made me laugh — one level of the campaign has you saving up enough money to buy the entire country of Switzerland instead of paying their high asking price for a certain genius who knows about a new kind of weapon. That’s just an example of what you can use your personal account for, and there are many ways of saving up. I think one reason console gamers have not had many stellar simulation games to play is the difficulty in getting all the controls and complicatedness to work smoothly without the use of a mouse and keyboard. 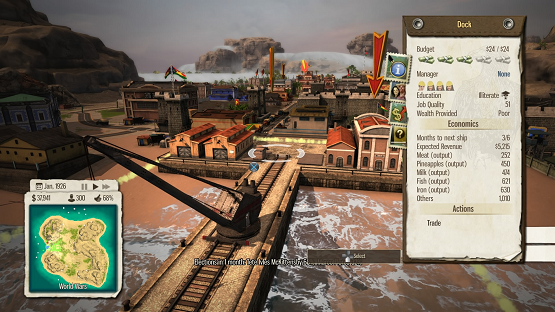 Tropico 5 pulls it off with option wheel-type menu systems that can handle instant maneuvering between large amounts of menu items. Using the trigger buttons instantly pulls up separate menus that then are easily navigated with the face buttons. This means you get to see all the many options that make a city-builder sim so fun and intriguing, as fast as, or faster than, if you were using a mouse and keyboard. The only speedbump I encountered was the learning curve in menus when I was forced to use the clunky directional pad. After the fluidity of using the joysticks in the menu wheel, having to use the d-pad for some things felt slow and not very clear. Along this same line, I will note that some options in the game are toggles that were not very clearly shown as being toggled ON or being toggled OFF, in addition to not being clear what effects the toggle had. I tried to think of any menu that was missing from the game, and the only thing I could think of was the lack of a citizen list or demographic viewer menu. This would have been okay to omit if not for the rebels and family trees that make up your citizens. I realize that in the real world it would be hard to pin down a rebel leader or mob boss. However, it matters if you arrest, bribe, banish, or kill anyone. Their spouse and family are affected, and your plans could backfire. Even a simple list of citizens that I could look through and examine individuals from would be fine. I’d just have to write down or remember any specific citizens name if I wanted to find them again. I won’t bother going through how the basics of a city builder work, as I think you understand most of it if you live in any civilization in real life. But I will say that they scope of Tropico 5, with the added intricacies of politics, makes this game much more fun and in-depth. That’s something other city sims don’t have. The parody in particular is especially entertaining. Once you progress out of the colonial era, you get to hear the perky ramblings of a girl who manages a tavern called the Jolly Rodger, which I think is supposed to represent pirate radio and a public truth-teller you cannot control. She has something to say about almost every new milestone, and she makes sure to embarrass El Presidente any chance she gets, like when you hire surveillance to warn you of any new rebel leaders. The voice acting is top-notch, mainly because it’s so spirited and spot-on for whatever person is being parodied. I appreciate that in a city sim. After all, why build up a regular ol’ society when you could be building one that makes fun of things that have happened in our actual history? 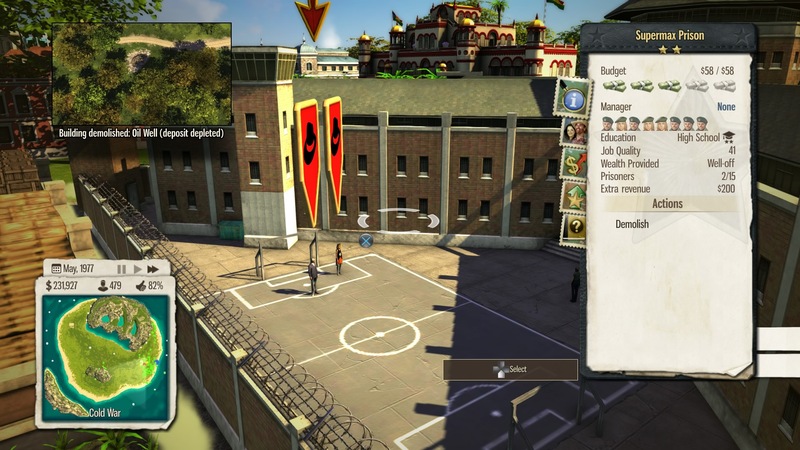 Tropico 5 on the Ps4 is the first city-builder we have had for the console, and it thankfully does a great job at it. I won’t be getting bored of it any time soon, as there are so many ways to play it. It’s flaws are quickly overlooked as you have fun with the gameplay and narrative. The graphics are fun to inspect, because every citizen and building are as detailed as the menu system that rules their lives. From the campaign, to the sandbox, and even to the multiplayer, I’m eager to make sure that the Ivles McKittensby dynasty becomes a ruling force to reckon with in my quest to make and govern the perfect tropical island. 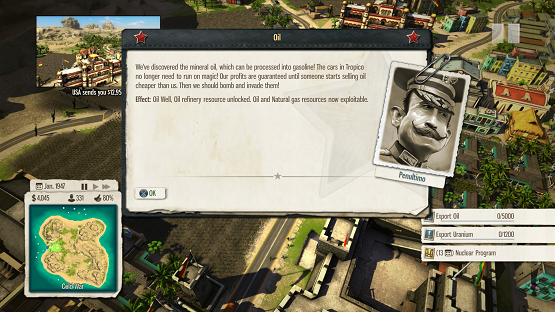 Tropico 5 review copy provided by publisher. For information on scoring, please read our Review Policy here. Finally, a city builder for PS4!